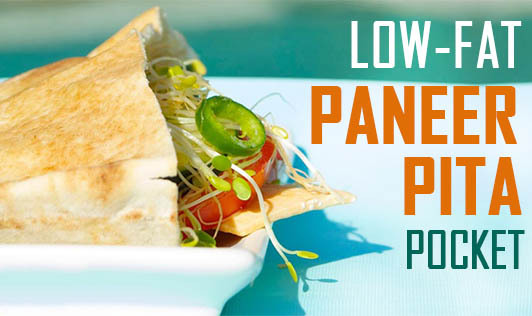 Low fat paneer pita pocket, is a perfect packed lunch option for boring tiffin. 1. Add whole wheat flour, yeast, sugar, salt in a bowl, and knead it together to make a soft and smooth, elastic dough. 2. Add the oil and knead it again until smooth. 3. Cover the dough with a wet muslin cloth for 15 to 20 minutes and allow it to double in size. 4. Knock back the dough lightly to remove the air and divide it into 4 equal parts. 5. Roll out thick 4" diameter rotis. 6. Cook the pita bread on a hot tava till the bread puffs and a hollow cavity is created in it. 7. Cut the pita bread into 2 halves and keep aside. 1. Whisk hung curd, mustard powder, sugar, lemon juice, olive oil, garlic, and ginger together and keep aside. 2. Add paneer, all chopped vegetables, coriander, and celery to the whisked mixture, and gently mix them. Let the mixture marinate for about an hour in the fridge. 3. Divide the paneer stuffing into 4 equal parts. 4. To serve, slightly warm the pita bread on the tava, stuff it with the mixture and serve immediately. • You can make low fat paneer and curd at home using skim milk or slim milk instead of whole milk. • You can use normal paneer and curd instead of low-fat paneer.